When I was in fashion school, I literally had only 4 clothing items in my wardrobe: Oversized t-shirts, baggy jeans, knee-length kurtas and track pants. I had a few pieces of each in different colours, but the basic silhouette and structure was the same. I was so used to wearing the same clothes on a daily basis that my classmates had labelled it my uniform. What most of them did not realise is, the clothes I wore were the only ones available that would fit my fat body! In fact, the t-shirts I used to wear were from the men’s section as the women’s one would be tight. And the kurtas were tailor made. Today the options are not as limited as back then, but, as a plus size woman I still struggle to find quality clothes that complement my body. Globally, the fashion world is getting more inclusive. However, the Indian fashion industry has yet to to come to terms with body positivity and non straight size bodies. 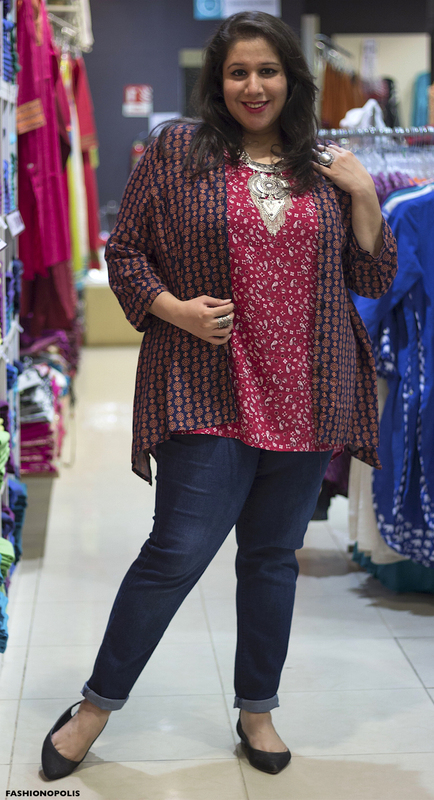 In India, the body positive revolution is in its nascent stages and plus size fashion is still not considered a part of mainstream fashion. Not only is this problematic but also discriminatory. For a country that is inherently on the curvy side and more than 60% of our population is size (UK) 10-12 and up, we barely address the needs of plus size people. Most fashion brands in India are still playing it safe and catering mainly to straight sizes. But not all. There are a few brands who have opted for a more body positive and size inclusive approach. These brands have understood the needs of plus size people and decided to give them what they want. 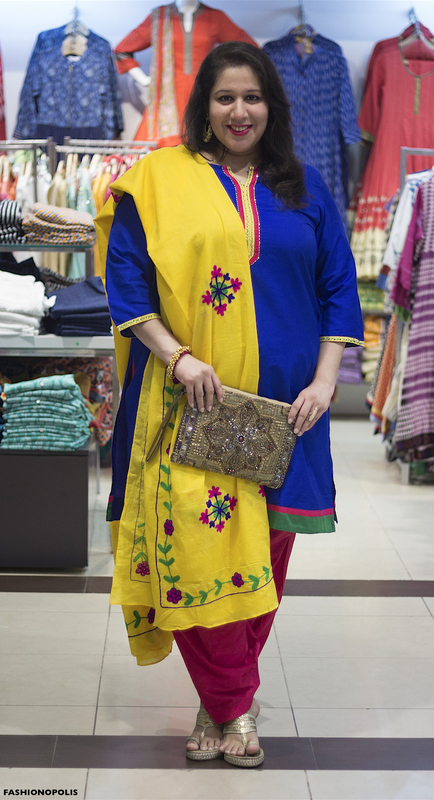 By choosing to be more size inclusive, plus size fashion brands in India are breaking the age old stereotype that plus size and fat people can’t be stylish and don’t like to dress up. 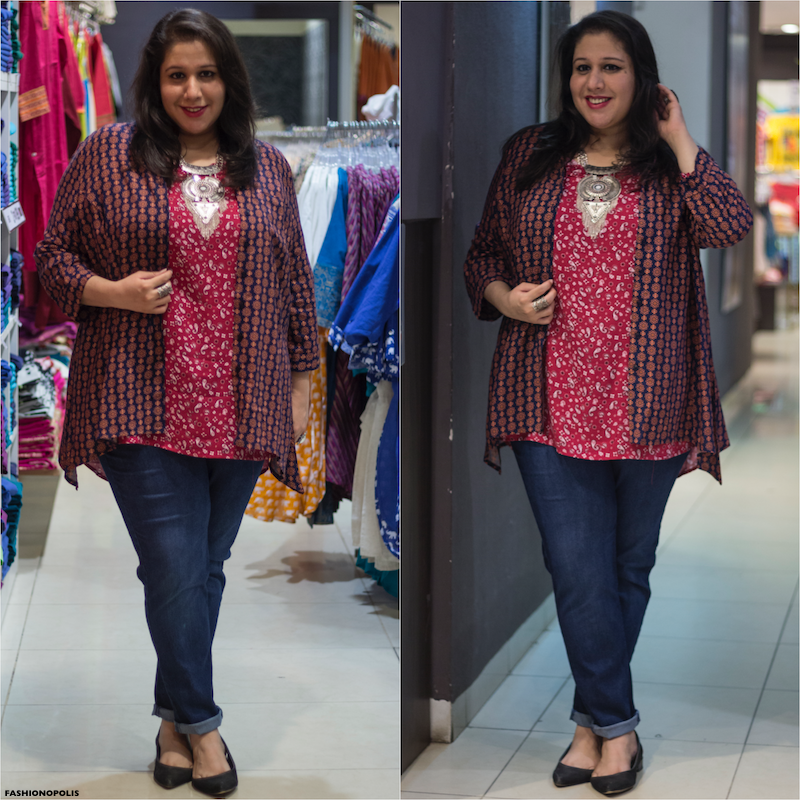 As a plus size fashion blogger, I am a patron of most plus size fashion brands in India. As much as I love their clothes, it is extremely important to talk about the amazing work these brands are doing. One such brand is Alto Moda by Pantaloons. 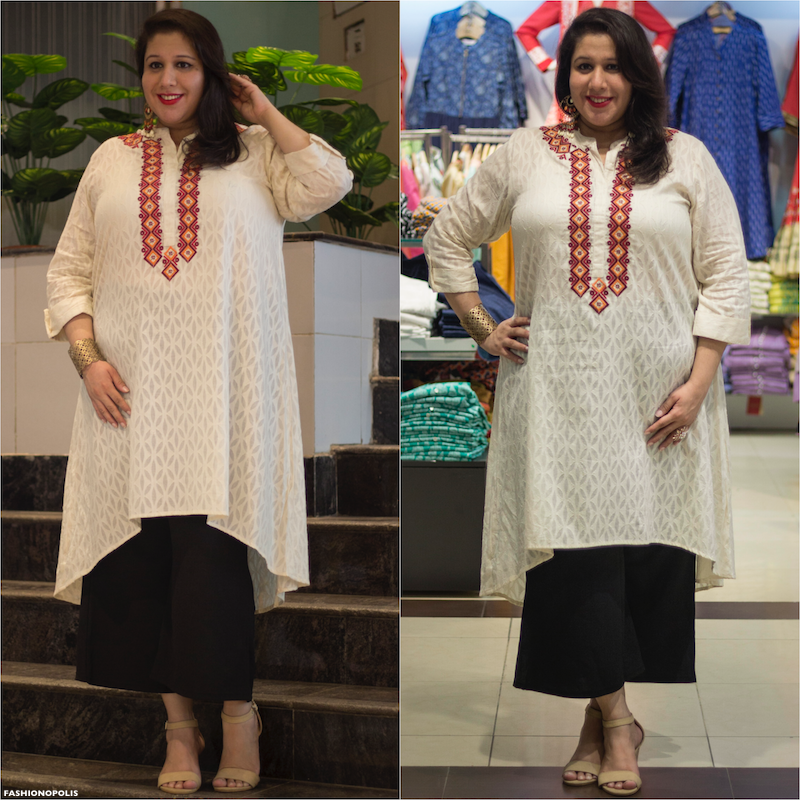 One of the first few brands in India to embrace plus size fashion, Alto Moda has been my go to brand for a few years now. When I finally got the chance to collaborate with them, I was beyond happy. For starters, I could fit in all their clothes and not a select few. You have no idea the kind of happiness freedom of choice can give you. From always being told, “sorry we don’t have this in your size”, to, “yes, we do have this in your size”, those words were like music to my ears. As a plus size fashion brand, Alto Moda is not just making clothes, but they are also creating quality and stylish collections that are flattering for different plus size body types. Along with providing amazing fit and on-trend designs, the brand is well priced too. The women’s wear range starts from Rs. 399/- onwards. 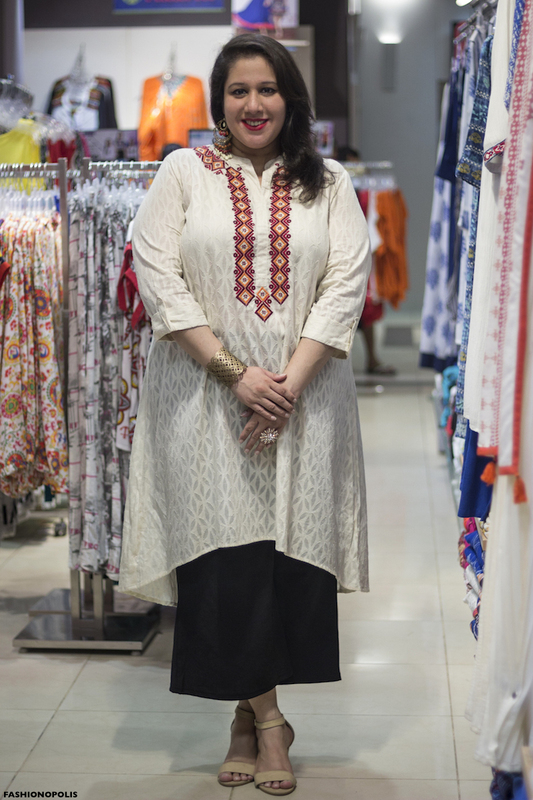 While most Indian fashion brands still prefer to cater to straight size only, by choosing to make plus size fashion their USP, Alto Moda has sent out a very strong body positive message. More Indian fashion brands need to follow their lead. One of Alto Moda's strength as a brand is, it has a diverse range of collections. From Indian wear to Western wear and from causal to festive, they have something for every mood and occasion. I decided to create three distinct looks that will help me showcase the brand's aesthetics and versatility. I love bright colours and I love colour blocking. I instantly fell in love with this salwar suit. 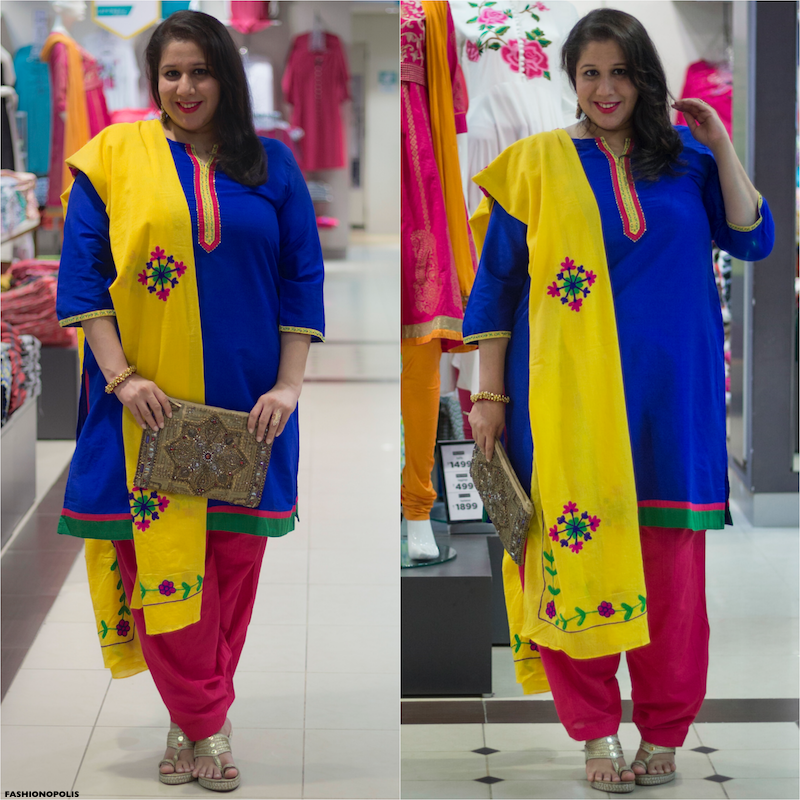 The vibrant colours in classic Indian silhouette suits most body types. 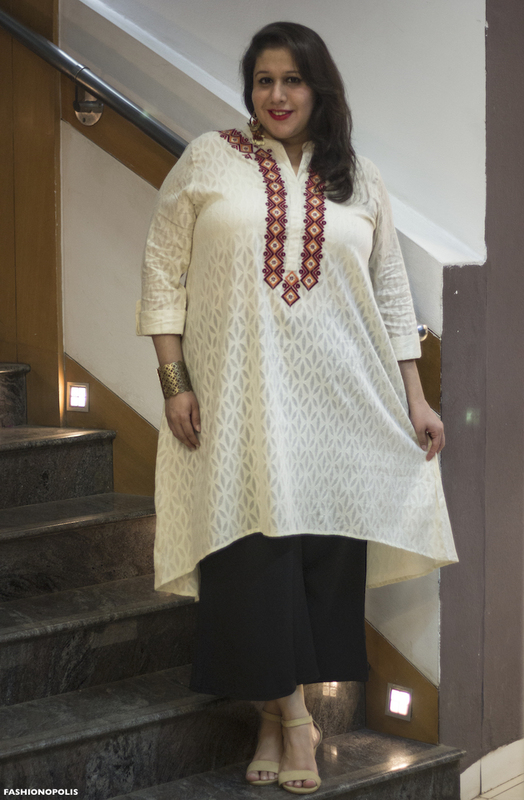 The kurta is a straight cut with a hint of A-Line and the salwar has the right amount of cowls to balance the look out. Depending on the occasion, the look can be glammed up or toned down. I have a weakness for prints and Alto Moda has some really pretty ones to play with. For a fun, print mix look, I decided to pair a paisley print top with a floral print shirt and classic blue jeans. What I liked about the shirt and top is, they are distinct, stand alone pieces and can also be paired with different pieces to create novel looks. Alto Moda offer a variety of separates - individual pieces that can be mixed and matched. This white tunic instantly caught my eye. The asymmetrical hemline gave it an interesting edge. Instead of pairing it with leggings or jeans, I chose to pair it with black ankle length palazzos. The end result was a sophisticated, black and white, Indo-Western fusion look. This is one of those looks that complements most body types and is multi-occasion friendly. 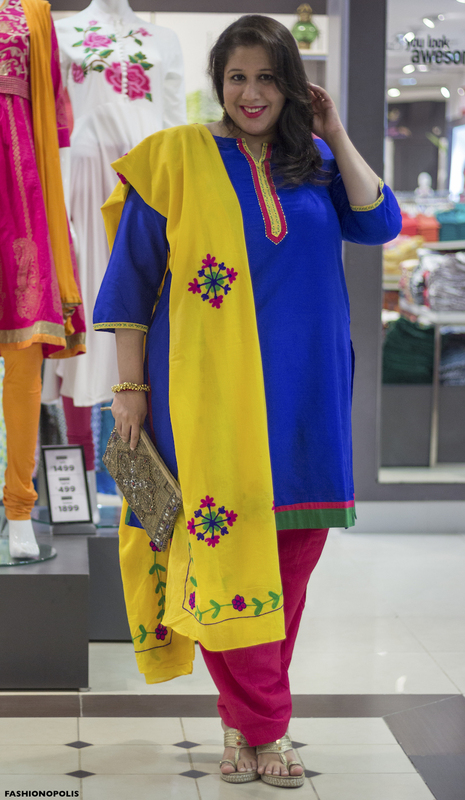 Along with affordable and trendy plus size clothes, Alto Moda has a vast variety of India wear and Indo-Western fusion pieces. The fabrics and silhouettes are perfect for plus size bodies and the designs are a healthy mix of classics and new trends. The Western wear section has a wide selection of tops, shirts and jeans. I do wish they had more options in dresses, skirts, jackets and party wear attire. There is a serious demand and need of quality western office and evening wear clothes. Along with the women's wear, Alto Moda also has wonderful men's wear section for plus size men. As a plus size woman who has struggled to find quality clothes her entire adult life, a brand like Alto Moda is a blessing and boon. They have managed to understand the needs of plus size people and create clothes that look good, fit well and give us confidence. Alto Moda is not just making stylish plus size clothes. The brand is also sending out a very important social message. 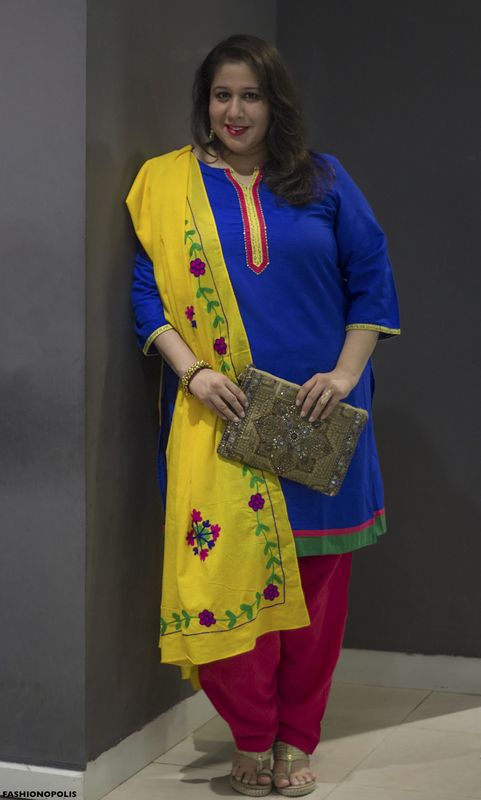 Where most fashion brands in India categorically ignore plus size people and their sartorial needs, here is a brand that is body positive and celebrates body diversity. A brand that has consciously chosen to be inclusive of different body types and has given visibly fat and plus size people a chance to dress stylishly, look good and be comfortable and confident in their own skin. Thank you Alto Moda for thinking about people like me and providing us with the best of fashion. Super blog. Thanks for sharing.Read more information. She is looking pretty even in her plus size. It will definitely give confidence to plus size people.